Built for the way babies read, the Indestructibles series has over 3 million copies in print, and shipped more than 700,000 copies in 2017. Sweet, soothing books, uniquely designed for safety and convenience, Indestructibles are printed on lightweight, nontoxic paper material, easy to clean (even dishwasher safe), and 100% chew, rip, bend, and drool proof. Busy City introduces babies to the bustling city, with lots of sights and sounds to experience on every page. Delightful for babies to page through on their own or with Mum or Dad or an older sibling, this books, with its bright pictures and minimal text, is ideal for expecting parents, baby showers, or as a welcome-home gifts for a newborn. 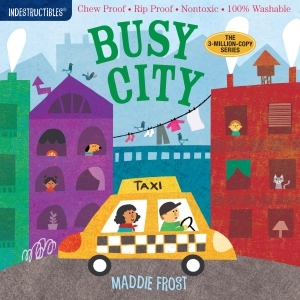 Waterproof, impossible to tear, easily washable, this cheerfully indestructible picture book joins the 3-million-copy Indestructibles series, introducing babies to the many sights and sounds of a city.